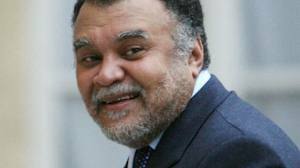 FIRST POST – AUGUST 22, 2012 – CONFIRMED ASSASSINATED: PRINCE BANDAR KILLED IN RETALIATION FOR HIS ROLE IN SYRIAN BOMB; JUBILATION IN THE STREETS OF DAMASCUS. “Prince” Bandar Bin Sultan is dead; assassinated by a car bomb placed especially for “His Excellency” by agents of Syria’s intelligence service exacting revenge for this weasel’s role in the July explosion in Damascus that took the life of four of Syria’s highest ranking generals: Lt. Gen. Dawood Rajiha, Lt. Gen. Hussein Turkmani; Lt. Gen. Assef Shawkat and Lt. Gen. Hicham Yikhtiar. His death is a source of jubilation inside Syria and a reminder that apes must be kept behind the iron bars of cages lest they run amok. The Western press, with few exceptions, has kept this under wraps at the request of their financier-pimps, the Qataris and Saudis. But the news is going to get out now. SyrPer was the only news source that confirmed this monkey Saudi’s role (along with the Israelis) in killing our four generals. This was the same group which killed Imad Moughniyya. Displaying his remarkably simian roots, the “Prince” smiles at a reporter who offers a banana. This runt was Saudi ambassador to the United States from 1983 until 2005 when the City of Washington D.C. ran out of blue jeans appropriate for squat, ape-like bipeds. He was the darling of Jewish neo-conservatives who knew how to make this “WOG” feel comfortable discussing his dreams of a Wahhabist-dominated Near East whilst they nodded in shrewish approbation. But he is now in Monkey Heaven with Cheetah, Mighty Joe Young and Flora the Chimpanzee. What we know about the details is meagre. The Saudis have tried to keep a tight lid on this. I mean, have you ever seen a family of agitated monkeys? A car was appropriately filled with Semtex and set with a fuse that was triggered by remote control. When this so-called prince and his security detail got into his car outside his tree house in the City of Riyadh, the finger of vengeance pushed the button and vaporized him and his entourage. Let him burn in Hell!! !